Forget what he would or would not do for love (i.e. anything, but not that) - famed rocker Meat Loaf and his gang are gaining some well-earned applause after what they did do to save a life. 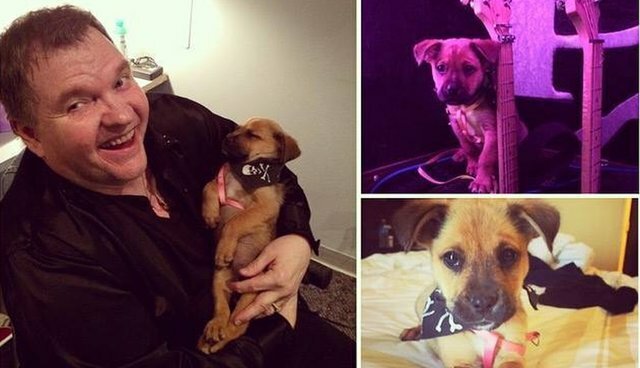 While on tour in New Mexico recently, the "Bat Out Of Hell" singer's road crew spotted some cruel person abandoning a little puppy inside a dumpster. Refusing to leave her there to die, they not only rescued the young dog, naming her Little Ms. Karma, they took her along with them to get her the care and comfort she needed. "We'll miss her but she's on her way to her new momma and sisters and a big ole ranch to run around and we're even more excited that she's staying a part of the extended Meat Loaf family forever!!!"